Christie®, a leader in creating and sharing the world’s best visual and audio experiences, continues its technological leadership with the introduction of the new CP2308-C high value Xenon projector, based on a powerful new electronics platform. Attendees at CineAsia 2016 will be the first in the world to encounter the new system, and also get a ‘sneak peek’ at a new Christie RGB laser projector. “We listened to the market and the result is a new level of value and user-friendliness in the CP2308-C, with many cost and feature benefits to our customers,” said Dr. Don Shaw, Sr. Director, Product Management, Christie. “The electronics package underpinning the model has been thoroughly beta-tested in real cinemas for over two years and sees its first appearance in a mass market product at this major global exhibition,” added Shaw. Created specifically for the burgeoning Chinese market, Christie is proud to launch the CP2308-C, on display in Christie booth #201. A high-value digital cinema projector, capable of projecting 9,000 DCI lumens (and 10,000 for alternative content), the CP2308-C comes with an integrated DCI playback engine, built-in automation features, and a new, more user-friendly UX design interface. Perfect for cinemas with smaller screens, this unit will support alternative content sources through dual HDMI ports (along with the integrated DCI playback engine, supporting DCI cinema and streaming content). 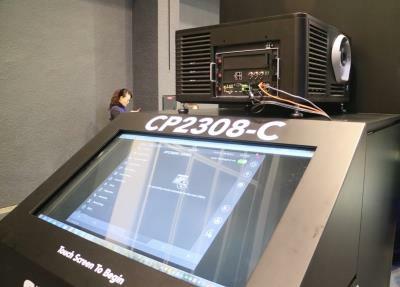 Alongside the CP2308-C in Christie booth #201 will be a technology preview of Christie’s digital-cinema laser projection family, boasting much higher efficiency than RGB lasers used in current cinemas. Also based on Christie’s latest Series 3 digital cinema electronics platform, this RGB laser projector has no need for sub-ambient cooling (i.e., no ‘chillers’ required) in a compact form factor, all-in-one design. Providing superior color, higher contrast, a future-proof design and low maintenance, this is the forerunner of a laser-projection solution intended for mainstream cinema applications; an ideal replacement product for aging Series 1 and early Series 2 projectors.